Keep your M9 and M9 variant sidearm always at arm's length with Lancer Tactical's 92F Drop Leg Holster. Simply loops onto your belt and secured onto your thigh by its system of adjustable straps with quick-release buckles so you can always find your pistol whenever you need it. 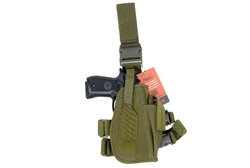 The Lancer Tactical 92F holster in Olive Drab is made out of tough 600 Denier Polyester materials. Featuring a tough and rigid frame that'll hold its form and take a beating during any firefight, it'll be sure to keep your pistol safe. The internal compartment itself is lined with a soft and smooth felt material to protect your pistol from unnecessary scuff and scratches while at the same time making it easier to draw or holster anytime you need it. A button and Velcro retention strap system can accommodate M9 pistols including tactical variations that features rail units, while a spare magazine pouch is integrated into the holster and can hold one additional magazine right next to your pistol to make reloads possible and convenient.